Informally known as the McKimmon Center, this structure was completed in 1976. It is named for a home demonstration leader who was among the first women to receive degrees from NC State. Lonnie Poole Jr. gave a generous gift to the university. If a person requests that we use the comma with his or her name, we should grant the request out of respect for the individual. We should also remember that when a building, fund or other entity is named after a person, the entity and the person are distinct from one another, and so are their names. Hence, at the request of Gov. Jim Hunt, we use the comma in his name. Gov. James B. Hunt, Jr. spoke to an appreciative audience. The James B. Hunt Jr. Library is one of the most technologically advanced learning and collaboration spaces in the world. This performance venue, located on the second floor of Thompson Hall, is operated by University Theatre, a division of Arts NC State. Kennedy-McIlwee Studio Theatre seats 103 patrons. The first federal legislation that authorized the creation of land-grant state universities was the Morrill Act of 1862. The legislation authorized the federal government to give states land that they could use to create universities that would teach "agriculture and mechanic arts" to the "industrial classes." The hyphenated adjective land-grant (lowercase and with hyphen, as in land-grant state universities, land-grant tradition, and land-grant institution) is in keeping with the editorial practice of the Association of Public and Land-Grant Universities. It is correct to say the state received a land grant (no hyphen). She earned a bachelor's degree in biomedical engineering. A major or field in a foreign language is designated by that language's name — e.g., English, Spanish, Russian, etc. — and is thus capitalized. When giving an NC State alumnus' undergraduate major and year in parentheses after their name, capitalize the major (this is an exception to AP style). State the major first and then the year. Also, state the year as a two-digit abbreviation preceded by an apostrophe. Leigh-Kathryn Bonner (International Studies '15) founded a company called Bee Downtown, an urban beekeeping startup. NCAA is acceptable on first reference. The hall recognizes the university's most accomplished athletes and coaches. Based in NC State's College of Agriculture and Life Sciences, NC State Extension provides informal education and research-based resources for all North Carolinians through programs focusing on agriculture, food and nutrition, and youth development. NC State Extension is part of North Carolina Cooperative Extension, a strategic partnership that comprises N.C. A&T State University, the U.S. Department of Agriculture's National Institute of Food and Agriculture, and 101 local governments statewide. NC State Extension never uses periods with the state abbreviation, but N.C. Cooperative Extension always does. N.C. Cooperative Extension has centers located in each of North Carolina's counties and with the Eastern Band of Cherokee Indians. From an organizational standpoint, the county and tribal Extension centers are part of N.C. Cooperative Extension, not of NC State Extension. The workshop was sponsored by Extension. The university's mission includes extension and engagement. To learn more, consult the NC State Extension brand site. The NC State University Libraries consists of the D.H. Hill Jr. Library (the main branch), the James B. Hunt Jr. Library, the Harrye B. Lyons Design Library, the Natural Resources Library, the William Rand Kenan Jr. Library of Veterinary Medicine and four campus information centers: the African American Cultural Center Library and Media Room, the College of Education Media and Educational Technology and Research Center, the GLBT Center Collection and the Mathematics Working Collection in the John W. Cell Mathematics Library. Because the NC State University Libraries is considered a single entity, the noun takes a singular verb and pronoun. The NC State University Libraries is hosting a series of data visualization workshops. NC State University Libraries are hosting a series of data visualization workshops. NC State's libraries often host data visualization workshops. Do not use NCSU to refer to NC State University in any way, regardless of whether the communication in question is internally or externally focused. Known until 1979 as the Agricultural Experiment Station, the agency is the research arm of the College of Agriculture and Life Sciences. The official name of the school that eventually became NC State, which was founded in 1887. In 1918 the name was formally changed to North Carolina State College of Agriculture and Engineering. In 1963 the name was changed to the University of North Carolina at Raleigh, causing students and alumni to protest. In 1965, the name was officially changed to North Carolina State University at Raleigh, although the final two words are rarely used in reference to the school. "North Carolina State University at Raleigh" is the full, official name of our institution and may be written when explicitly required on official documents. Writers and editors should otherwise avoid using this name because of the implication that another branch of North Carolina State University exists in another city. "North Carolina State University" is one of the two preferred forms of the university's full name. This form should be used on first reference in news releases and formal or ceremonial texts; and in other situations when a more formal tone is appropriate. "NC State University" is the other preferred form of the university's full name. This form should be used on first reference in material aimed at high school students and undergraduates, most advertisements and other situations when a more familiar tone is appropriate. 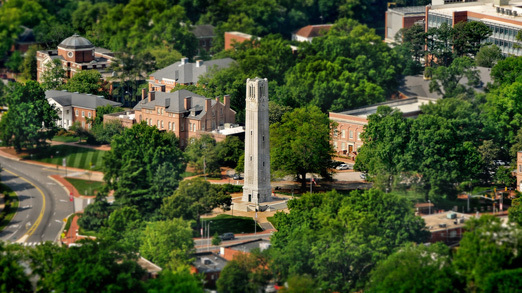 "NC State" is the preferred second reference in all situations, mainly used as a noun (e.g., "Welcome to NC State"). Because "university" is missing from this short form, be careful when using it as an adjective; i.e., "NC State Department of . . ." may be confused with a department of the government of the state of North Carolina. "The university" is an acceptable third reference.